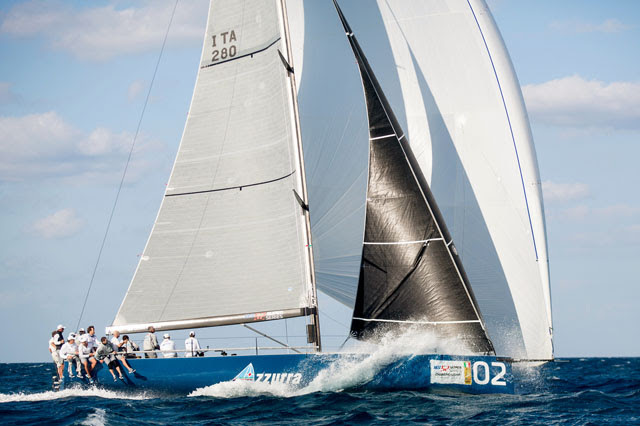 After some of the breeziest, most challenging conditions of recent TP 52 regattas in either Europe or the USA, Azzurra’s scoreline for the day of two second places and a win takes the Italian flagged team back into the overall lead of the 52 US Championship off Miami Beach, but their margin is still tight, only one single point ahead of Quantum Racing. It was only when they emerged victorious from a last race photo-finish with Takashi Okura’s Sled judged winners of the last, high speed race of the day that Azzurra stepped clear of the 52 Super Series champions the Ed Baird steered and skippered Quantum Racing who tallied out with two wins and a fourth today. The cross offshore westerly breeze topped 31 knots in one prolonged squall, was often up to 25 knots and probably averaged 19 or 20 knots over the three races. With a nasty chop and wind swell which built down the course, and very shifty, changeable pressure and angles at the top – closest to the shore – it was not just the wind velocity which placed a huge premium on slick, solid boat handling, but there were big gains and losses to be made especially downwind. And there were several big wipeouts. When a stanchion failed on Hooligan in three crew were catapulted into the water, one sustaining a suspected fractured arm. Quantum Racing won the first two races but their winning guns were hard earned. The first contest featured a thrilling head-to-head between the two leading protagonists all the way up the breezy first beat, head to head only ten metres apart, neither team crew blinking. Azzurra just had the slightest edge as they closed at the top turn, Quantum Racing tried to get inside them at the buoy and were penalised. They took their turn immediately and were quickly back on the chase. 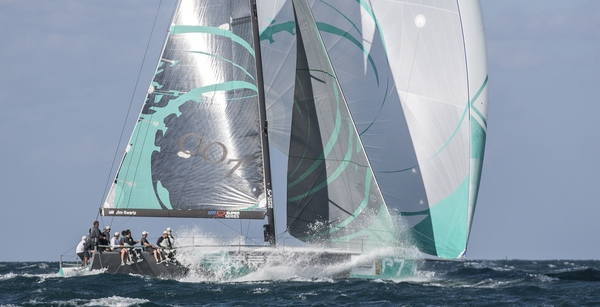 The second windward mark was all but a replica of the first, except it was Quantum Racing in the lead. Azzurra, hard on their transom, did not quite get the gennaker tack line on fast enough and while they struggled momentarily to bring the boat under control, the American team were able to race away. Azzurra only just held off Interlodge at the finish line. A big recovery was the key to Quantum Racing’s second win of the day. They were fifth at the first turn but executed a swift, smooth gybe set which got them straight on to the heels of great gust pattern. 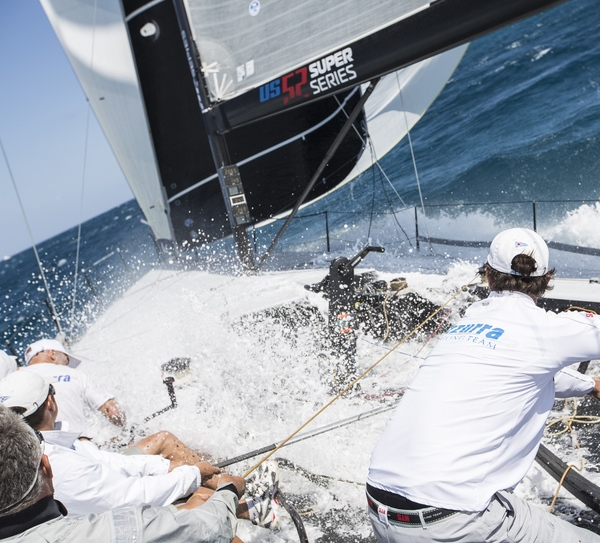 By the leeward turn they were – again – bow to bow with Azzurra. The crew from the Yacht Club Costa Smeralda struck out to the left, Quantum stayed right of middle and by the second turn Ed Baird, Terry Hutchinson and the Key West winners were in front. On the thrilling final run Quantum stayed right and extended, whilst Azzurra scraped through for second just ahead of the fast advancing Rán Racing. 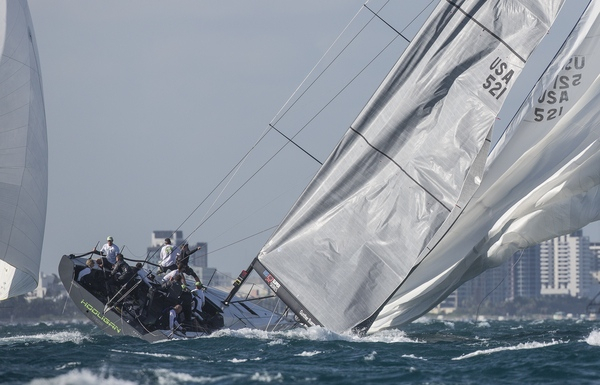 For all the world in the third race it looked as if Takashi Okura’s crew on Sled had done enough to earn their first US 52 Super Series win as they streaked down the final run having lead all the way around the track. But the indefatigable Azzurra team denied them on the line and they had to be content with their second second place of the season. From a very strong start Ross MacDonald had them into phase with the shifts well, just leading Azzurra at the windward mark. Quantum Racing again found themselves back in the pack. Azzurra came back at the leaders with a better windshift on the approach to the last turn of the day. That gave them a chance to challenge Sled down the run. Azzurra gybed away earlier, had one better gust, and were only just ahead at the finish gun. Azzurra go into the penultimate day of racing with a lead of one point over Quantum Racing, Austin and Gwen Fragomen’s Interlodge lies third in the 52 SUPER SERIES regatta 10 points behind. Miami may have delivered wind well in excess of its usual reputation for light early season winds, but Saturday’s forecast is for a return to ‘normal service’: gentle shifty winds.